Planning to drive to seashore for shellfish? Now you have no reason to drive that far. 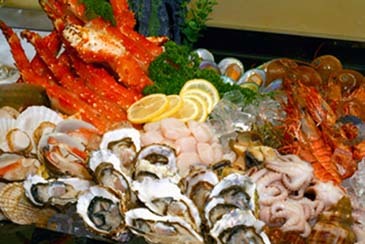 La Table at Ibis Ambassador Seoul brings the right taste of shellfishes, and it's buffet! The restaurant, popular among office workers for its superb level of cuisines offered at reasonable prices, offers "Shellfish Grill Corner" through November 11. The grill includes ear shell, shellfish, Hairy Triton, a comb pen shell and more. The dinner buffet serves complimentary white wine. The regular buffet is also upgraded with 8 types of vegetables and 8 types of dressings at salad bar. Also, chef-recommended 4 types of vegetable dishes, sushi, salmon and fresh sashimi are all there at one visit. 7 kinds of grilled dishes, seasonal fruits and beverages will complete your fine dining experience.